We set up the Next Net google group several months ago as a space to welcome discussions around the opportunities for a distributed, decentralized internet infrastructure. Now individuals from a range of projects are coming together, sharing ideas, and beginning to build out useful documentation of the necessary and existing components of an open hardware and software stack. Within the past week, members of the Future Forward Institute have put together a simple diagram of a minimal-requirements test case for experimenting with combinations of networks, protocols and resources. 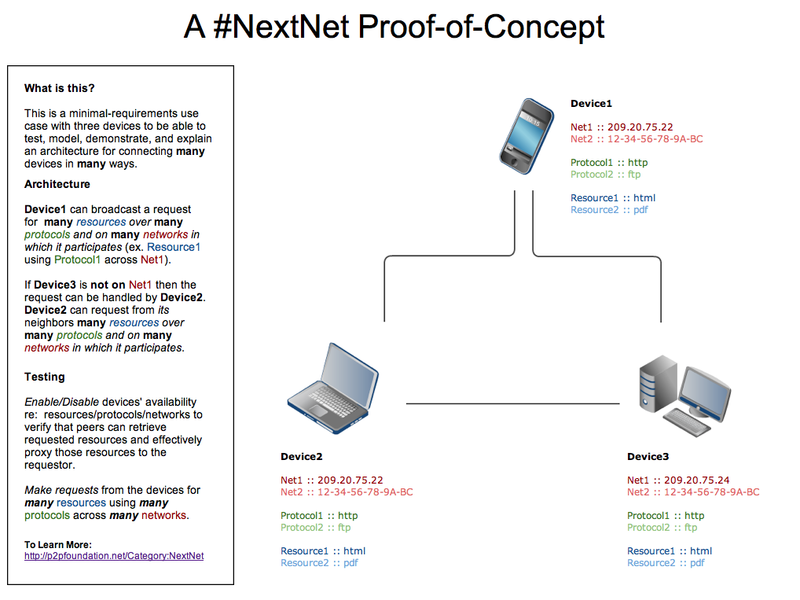 It consists of an initial arrangement of three devices, and can be scaled up to demonstrate how an architecture for connecting many devices in many ways could work. Identification & Evaluation Their next task is to understand the ecosystem of available components, stage of development, and to then establish a criteria by which to evaluate them. It’s my understanding that the baseline criteria is that the components must be open and interoperable. It’s a bit of an overwhelming endeavor, as there appears to be a lot of redundancy and overlap in what’s out there, and some projects have been stalled or abandoned. A full list of projects being evaluated can be found on the P2P Foundation Infrastructure wiki page here. For anyone interested in contributing to this effort or to add projects that are missing from the list, feel free to add to the wiki and join the discussion forum. A parallel project under discussion is the creation a roadmap for transition to a distributed, decentralized infrastructure that would exist under a commons based co-ownership model instead of corporate or government control. A small group is just in the process of scheduling a day and time next week to discuss the possibilities of such a municipal broadband network, and the process of building a co-owned physical layer. Their Doodle scheduler is here, and they’ll be using etherpad to set their agenda here. Stage one consists of the emergence of network access cooperatives. [A mesh network] allows us to share a single internet connection amongst many physically disparate locations. We and many others are able to purchase Internet access cooperatively, thus driving down the amount that each of us pays. This struggle for collective purchasing will happen in many towns and cities, in city blocks and subdivisions, in residential towers and intentional communities. The obvious economic advantage to the end user (reduced cost) makes this an easy sell to the people. The unseen benefit of the aforementioned co-ops is that they wrest the terminal nodes of the network away from the control of the telco/ISP hegemony. This provides for the opportunity of network applications that are truly peer-to-peer. At first, this will only happen within each isolated cooperative community. Imagine a town that makes shared use of a few pipes, whose flow of information is distributed accross the last mile via mesh. Now imagine each node of that mesh network is a Diaspora pod running a codebase that is specifically designed for use in mesh networks. There is still a reliance on the big pipes for access to the wider internet, but to pass each other messages and participate in social networking, at the town level, a truly peer-to-peer architecture will be in place. Thus arises the digital village. What used to be just a co-op for purchasing access has suddenly become a community that is able to share information directly with one another. It takes only a little more imagination to see that Diaspora is one of many applications that could run on this architecture. Using packet tunnelling (i.e. Freenet or TOR) in concert with the existing global network, we can simulate the contiguity of geographically disparate digital villages. Suddenly, people all over the world are able to share with one another directly. Specify a user@a_node@a_network and you’ve got a unique address for each network user. Of course, the corporate giants still own the backbone at this stage, which is why we can only say *towards* unity. Stage 4 is when the dream of true co-ownership becomes a reality. In this stage, the corporate-owned fiber backbone is replaced with a community-owned backbone. This could be accomplished via a constellation of telecommunications satellites or the construction of HF or Whitespace radios. Satellite dishes or TV-Band towers would replace the pipes that used to come from the ISP, and their connectivity could be distributed throughout every digital village. The only cost that anyone would ever have to pay for network access would be the cost of a mesh node (could be integrated into a PC, or shareable stand alone). Not everyone will be able to afford a node, which is why the roadmap doesn’t end with Stage 4. Once the Mesh Interface for Network Devices is global, energies can be focused towards providing a node to anyone who wants one. We believe that access to the network is a human right, and this is our vision for supplying it to all of humanity. A common counter-argument to this proposal is that mesh technologies don’t scale beyond a few thousand nodes. Our rebuttal is that they won’t have to. The federation of digital villages means that no single mesh would have to grow larger than some optimal number. Furthermore, there is reason to believe that mesh routing protocols will improve rapidly in the near future. The wide release of B.A.T.M.A.N. will provide for a significant improvement in performance of O.L.S.R. The folks in the forum are certainly aspirational, but a combination of big vision with practical tangible immediate actions is exciting and inspiring to watch! More updates to come as progress is made. Check out our website for the Contact Conference, a participatory gathering around p2p technology, culture, commerce, and governance. Wonderful imitiative. My engineerimg mind feels like diving in. Let me add a philosophical layer, just in from a long-time investigative reporter. This is my point. No matter how you define or describe WHAT EXISTS, no matter how wide a net you cast, no matter what qualities or powers you ascribe to those levels that ALREADY EXIST, someone can come along and create levels that are entirely new, and THESE levels aren’t in the net, they aren’t in any net, they are beyond what has been established in the past. Given this fact, are you ready to say that the search for illumination ends with what has already been established? Are you ready to say that REALIZATION OF SELF ends with discovering some level of reality that has already been put there? Whereas the truth is you can create infinitely. AND WHAT YOU CREATE IS NEW.